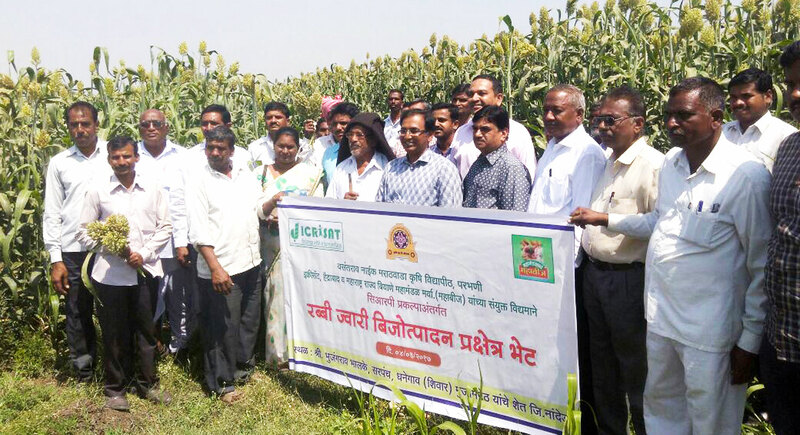 In order to increase the uptake of improved post-rainy sorghum cultivars in India, a Sorghum Seed Consortium has successfully promoted the distribution of seeds of improved cultivars among thousands of farmers in Maharashtra, India. So far over 40,000 farmers in Maharashtra have benefited from the improved cultivars: Parbhani Moti, Parbhani Jyoti, Phule Vasudha and Phule Revati. As a result of the efforts of the consortium, the production of improved sorghum seed has increased from 300 tons in 2013 to 3000 tons in 2016. The improved varieties are now widely used in the Western Maharashtra and Marathwada regions of Maharashtra. The traditionally popular post-rainy sorghum cultivar M 35-1 (Maldandi) is being replaced with improved varieties, resulting in enhanced crop productivity. Grain yields have increased by 40% and stover yields by 30%. Economic analysis of seed production showed that seed growers get a return-cost ratio of 2.21 compared to 1.44 for grain producers. 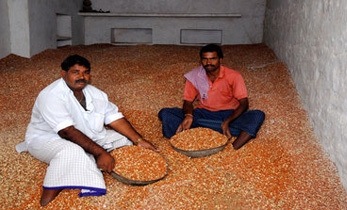 Currently, seed production of improved sorghum cultivars is taking place on 3000 farmers’ fields in Maharashtra and the improved seeds are delivered to 300,000 farmers across India (8% of total post-rainy sorghum farmers in India) annually. 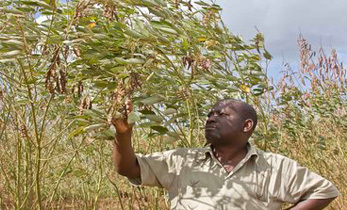 Being open-pollinated cultivars, these seeds are reused and exchanged with fellow farmers. 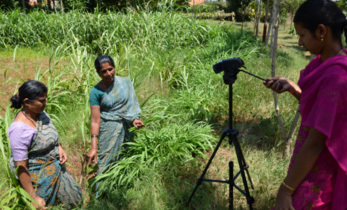 Indian national agricultural research systems (NARS) and ICRISAT also support the farmers with improved management practices. 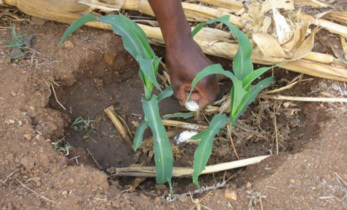 Universities supply breeder seed of improved post-rainy sorghum cultivars and train the farmers. MSSCA certifies all the seed plots. 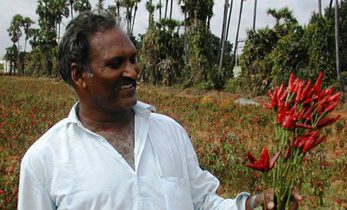 Mahabeej procures the seeds at a price which is 25% higher than the market price of grain, processes them and commercializes them across post-rainy sorghum states in India. ICRISAT monitors the entire activity and provides some financial support for capacity building of seed farmers and seed plots registration with a certification agency. Post-rainy sorghum is grown on 4 million ha in India. Although sorghum is prized for its grain and fodder, in the past few decades, terminal drought stress, low temperatures at flowering and farmers’ preference for the bold, lustrous white grains in adapted landrace cultivars had limited the genetic variability in sorghum crops. This, coupled with limited efforts for hybrid development, had resulted in a low acceptance (20%) of improved cultivars of sorghum in India. 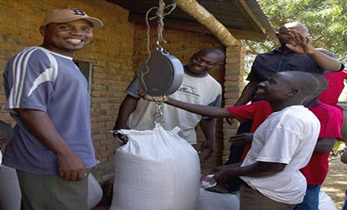 To improve this situation, the consortium was formed as an exit strategy in 2013 when the Harnessing Opportunities for Productivity Enhancement (HOPE) of Sorghum and Millets project, funded by the Bill & Melinda Gates Foundation, completed its activities in India. On 4 March, Mahabeej conducted a farmer’s field visit to seed production plots and arranged an interaction meeting in Dhanegoan village near Nanded, Maharashtra. Over 100 seed growers participated in the events, including Dr A Ashok Kumar, Principal Scientist – Sorghum Breeding, ICRISAT, and Dr HV Kalpande, Senior Scientist along with Mr Rushikesh Aundhekar, Senior Research Associate from Vasantrao Naik Marathwada Krishi Vidyapeeth (VNMKV), Parbhani.